On October 15, 2005, GRILA will be commemorating the 18 anniversary of the assassination of Thomas Sankara, Burkina Faso’s first president. Sankara embodied hope for true change through self-directed and panafricanist development. At the age of 37, this internationalist joined the pantheon of the incorruptible. Sankara introduced change that continues to be relevant to Africa and its growing entrapment by donor countries and agencies, pauperization and conflicts rooted in the pillage of the continent’s resources. Sankara was assassinated along with 10 of his comrades. Eighteen years later his executioners hide behind his death certificate that states he died of natural causes. The Minister of Justice of Burkina Faso at the time is now the President. 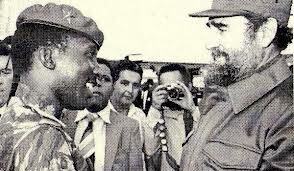 On October 15, 2002, after having been shunted from court to court in Burkina Faso, Sankara’s widow, Miriam Sankara, and his children, represented by the lawyers of the International Justice for Sankara Legal Collective* brought the case before the United Nations Human Rights Committee. At its 80th session in New Your in April 2004, the UN Human Rights Committee deemed the communication against Burkina Faso admissible, constituting a legal precedent against impunity in Africa. On September 27, 2004, the regime in Burkina Faso contested the jurisdiction of the UN Human Rights Committee and tried to cloud the key question of its responsibility in the assassination of Thomas Sankara and his comrades, arguing that his widow and her supporters were simply trying to discredit the regime and seek vengeance. On October 4, 2004, General Tarnue, testifying before the Special Court for Sierra Leone, referred to a plot hatched by the current president of Burkina Faso, Blaise Compaoré, and former rebel and head of state of Liberia, Charles Taylor to assassinate Thomas Sankara (see http://www.sc-sl.org/transcripts/RUF-100404.pdf, pp 84-85). In November 2004, the lawyers from the International Justice for Sankara Legal Collective responded with a communication based on Committee precedents as well as General Tarnue’s revelations. The State party was supposed to respond by January 2005. It obtained an extension to February 28, then another to March 31 and since then has exploited the Committee’s patience. In the meantime, the regime amended Burkina’s Faso’s constitution to enable President Compaoré to run for a third term. Burkina Faso—where impunity has become a pillar of the political system—is clearly obstructing justice. In a country where assassination, corruption and intimidation run unchecked, the campaign’s lawyers have demanded interim measures from the UN Committee in order to protect the integrity of Sankara’s grave and key documents. Support the International Justice for Sankara Campaign and send a clear message against impunity in Africa!